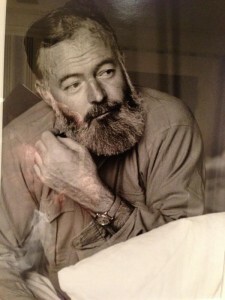 The above text reflects in a nutshell the type of man Ernest Hemingway was and what kind of life he lived. However, this is only one side of the story. 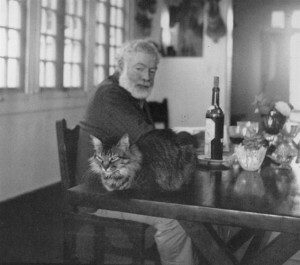 Hemingway suffered from bipolar disorder and had severe depressions. 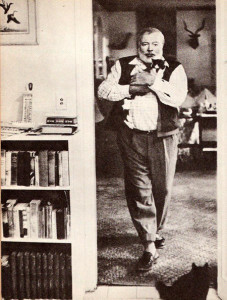 In 1960 Hemingway was treated with ECT (‘Electro Convulsive Therapy’, “Electroshock”) in the Mayo Clinic, about which he said: “What these shock doctors don’t know is about writers…and what they do to them…What is the sense of ruining my head and erasing my memory, which is my capital, and putting me out of business? It was a brilliant cure but we lost the patient.” Eventually, in Idaho in 1961, he ended his life by shooting himself in the head; the way in which he committed this act is completely in line with Hemingway’s character. This 1929 Rolls Royce Phantom II Short Coupled Saloon used to belong to Ernest Hemingway. 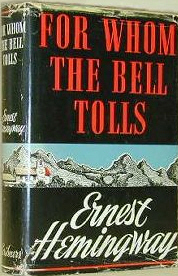 With this car he traversed the USA while writing and publishing ‘A Farewell to Arms’, ‘The Fifth Column and the First Forty-Nine Stories’, and ‘Death in the Afternoon’. 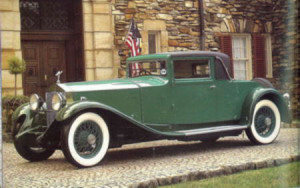 The car is provided with compartments for booze, golf and hunting stores. 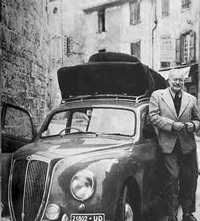 Another car owned by Hemingway is the Lancia B10 with which he travelled through Europe in 1954. In the Winter of 1917 the Red Cross started a campaign for the recruitment of American volunteers who would drive ambulances at the Italian front. Hemingway applied for the job, because the American army refused to take him into service due to a bad eye. 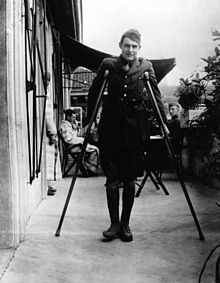 On 8 July 1918, only a few weeks after his arrival, he suffered leg injuries inflicted by shell-splinters while distributing chocolate and cigarettes among Italian soldiers along the river Piave. 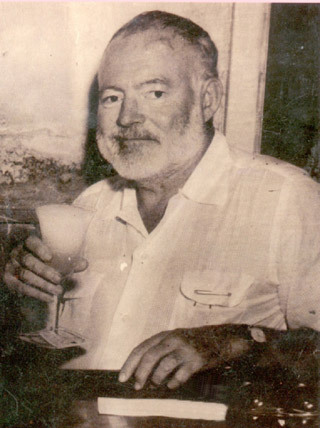 According to Ted Brumback, another ambulance driver, who wrote Hemingway’s father a letter, more than 200 splinters pierced Hemingway’s legs, but he managed nevertheless to get another wounded soldier to the first-aid post. On his way his legs were hit by machine gun bullets on top. Later, for this act of self-sacrifice he was rewarded the Italian Heroism Silver Medal. His right knee was injured so badly that he feared amputation. Recovering from his injuries in a Milan hospital, Hemingway fell in love with Agnes von Kurowsky, a well-educated American nurse who was eight years his senior. Hemingway would incorporate this romance in his novel ‘A Farewell to Arms’. 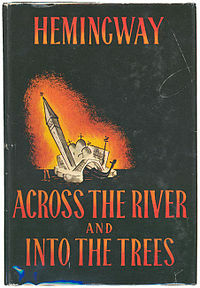 The book tells the story of Robert Jordan, a young American explosive expert, who as member of the International Brigades is added to an antifascist guerilla unit in the mountains during the Spanish Civil War. Jointly they have to blow up a bridge in order to make an attack on Segovia a success. During this mission Jordan falls in love with Maria, a girl who had lost her parents in the war. 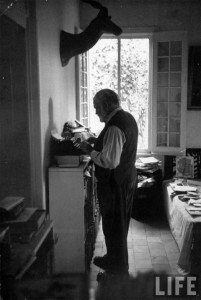 The book is partially autobiographic, Hemingway was in Spain during the civil war. 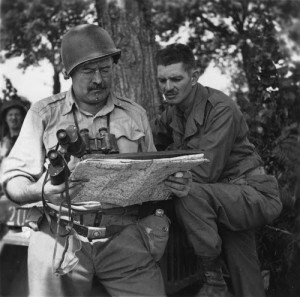 The main character may be based on Robert Hale Merriman, an American who was killed in Spain in 1938. Merriman was an acquaintance of Hemingway’s. 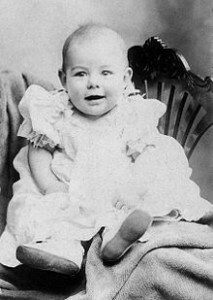 The picture of the Bubbleback was made in the Ralph Lauren dressing room on Worth Avenue in Palm Beach, Florida. In Cuba in 1951 Hemingway wrote one of his best-known novels ‘The Old Man and the Sea’. Published in 1952, it was Hemingway’s final important fictive work to be published during his life. 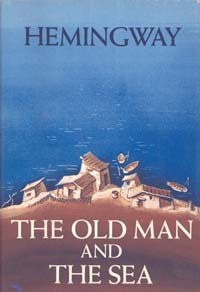 The story is about Santiago, an old fisherman, who did not catch any fish in 84 days. The parents of his pupil Manolin do no longer allow the boy to accompany him, he must join more successful fishermen, but the boy does not stop looking after the old man. In the evening he will bring Santiago food and they will talk endlessly about the famous American baseball player Joe DiMaggio. 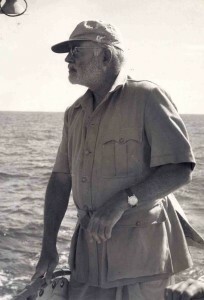 That night Santiago tells the boy that the next day he will sail on his own as far as the Gulf Stream, north of Cuba in the Straits of Florida, and his ‘salao’ (the greatest misfortune) will be over. On day 85 at noon Santiago has a bite, a big fish and he strongly believes the fish to be a marline. A struggle develops which will last three days and when the fish has finally been attached to his boat, Santiago is exhausted and almost delirious. 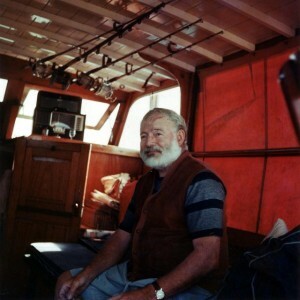 While he is figuring up how much money this marline will bring him in, the first sharks appear, attracted by the trail of blood behind the boat. Santiago succeeds in beating off the first five sharks, but they continue returning. Eventually, he returns to the port with only the huge skeleton of the fish. When worried Manolin visits him that night, Santiago is asleep, dreaming about his childhood, lions on an African beach. 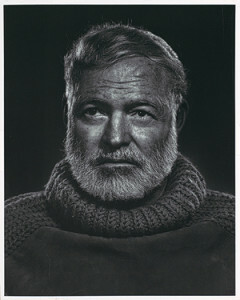 In 1953 ‘The Old Man and the Sea’ was awarded the Pulitzer Prize for Fiction and the book contributed largely to the Nobel Prize for Literature awarded to Ernest Hemingway in 1954. 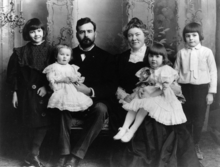 The Sandoz Family Foundation was established in 1964 by the sculptor and painter Edouard-Marcel Sandoz, the son of the founder of Sandoz SA in Basel (presently Novartis SA). The aim of the Foundation is promoting entrepreneurship by means of long-term shares in companies in various sectors. 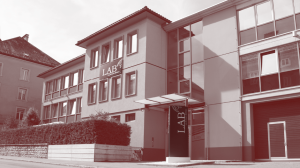 Apart from the commercial criteria the Foundation stimulates entrepreneurship and innovation as well as preserves the Swiss entrepreneurial tradition. It adds to it that the investments are focused on strategic goals which allow high quality and fundamental social values to be maintained. 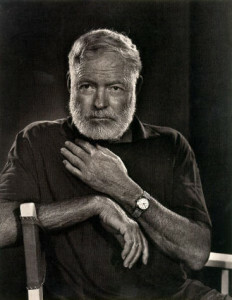 The Foundation also encourages creativity and private initiatives. As a counterbalance against the commercial activities the Foundation also occupies itself with art and culture, under the flag of the Fondation Edouard et Maurice Sandoz (FEMS), and science. The Foundation is directly or indirectly involved in the pharmaceutical industry and agriculture, hotels, the watch industry, telecommunication and the Internet through a variety of organizations and holdings. The thinking behind every involvement is its focus on innovative strength in technology, sustainable developments and the creation of new jobs. The Foundation is run by the management board and is supervised by Pierre Landolt, the family’s representative. Other members of the board are Maître Olivier Verrey and Gabriel Pretre. 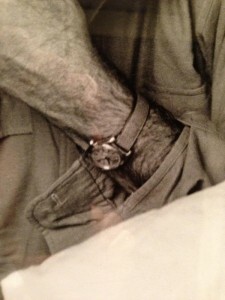 The Sandoz Collection contains many kinds of objects, including (pocket) watches, of great historical value. Besides Parmigiani Fleurier’s worldwide top brand repute within the Swiss luxurious watch industry, the branch presently occupies an important economic and industrial position in the Val-de-Travers region. The branch’s history is closely interconnected with that of the valley. This appears from the fact that, in 1976, Michel Parmigiani selected Fleurier to start his first studio with, whereas the environment was declared a disaster area. 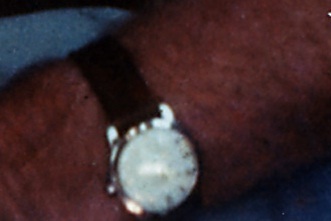 The advent of electronic watches hit the valley hard and many prominent manufacturers of mechanic watches did not survive this blow. 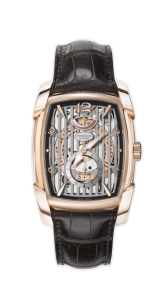 Parmigiani’s firm belief that the region would make a strong come-back was shared by the Sandoz Family Foundation which, in 1996, decided to support Michel Parmigiani in developing his branch. Since that time the watch industry has become increasingly strong, leading to other watch manufacturers to feeling drawn to get settled in this region. Parmigiani Fleurier was the first to breathe new life into the century-old Swiss tradition of watch makers in this area and by doing so they have created 350 jobs in Fleurier by now. In order to continue the company’s extraordinary know-how in the future, they are training students in almost any facet of watch making. The Vaucher Manufacture Fleurier factory was established in November 2003. 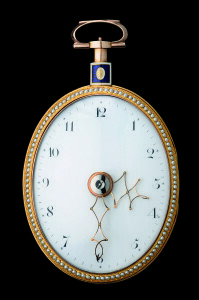 This meant the division of Parmigiani Mesure et Art du Temps (founded by Michel Parmigiani in 1976) into two associated companies: the production part and the Parmigiani Fleurier branch, by which all of the watch makers’ activities were separated from the promotion of the branch itself. 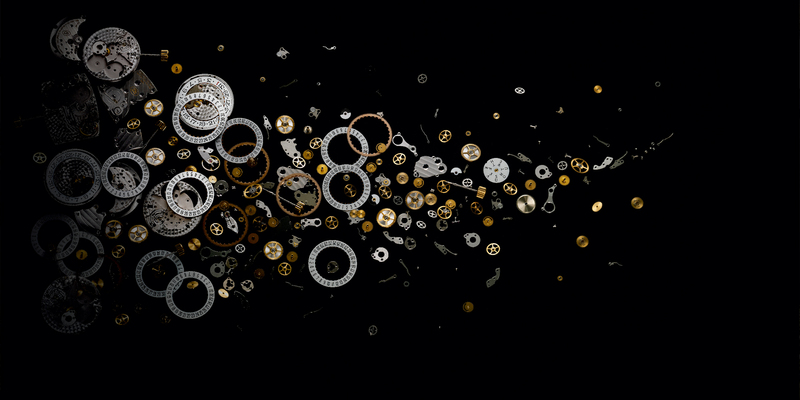 Established in Fleurier, Vaucher Manufacture Fleurier specialises in the High-end and Prestige sectors and goes into the large-scale production of outstanding watches clearly reflecting the image of Parmigiani Fleurier. 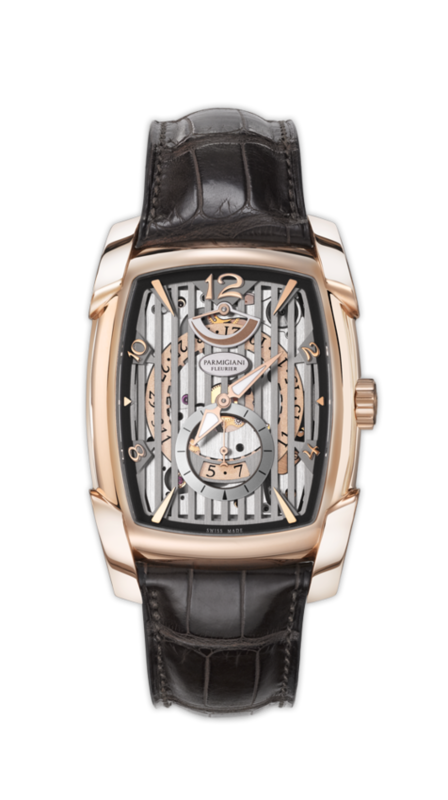 In this way the private label Michel Parmigiani had ever held in view has been preserved and additionally, Parmigiani Fleurier is given the opportunity of delivering watches to third parties. This means that Research and Development, the CNC production of plates, bridges and a few watch parts, a large mechanic workroom, decoration of plates and bridges and handicraft for embellishing the parts and the eventual manual assembly are joined together in a production plant. The Manufacture’s activities were distributed among three locations until 2009, but as of 4 September 2009 they have been concentrated in a 40,000 m2 building, thanks to the support of the Sandoz Family Foundation. 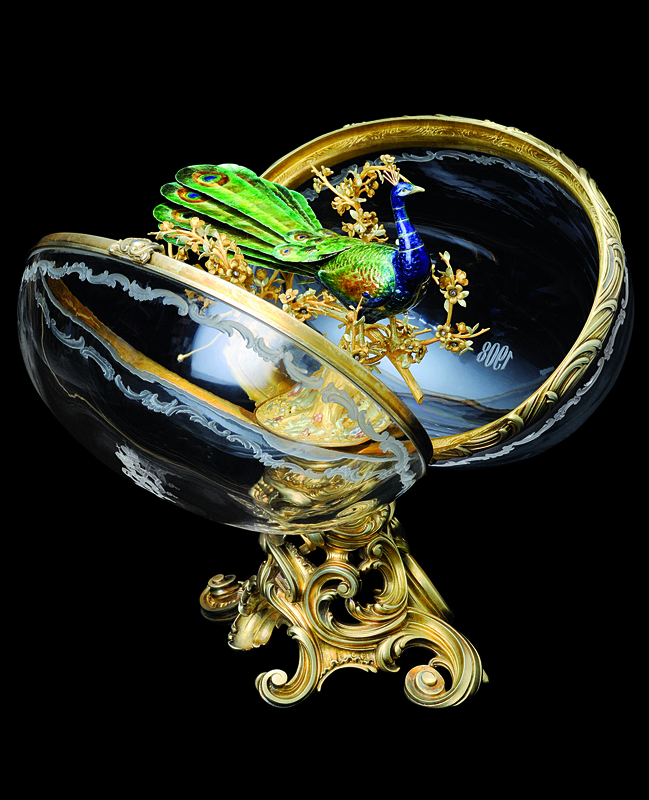 Parmigiani intended to be a real manufacturer and to this end, it purchased a number of specialised companies, which was an act of tactics. 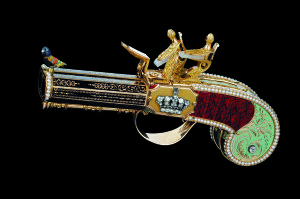 Among those Atokalpa was obtained in December 2000. Located in Alle, in the Jura (the crib of precision work at millimeter level), Atokalpa had made a long-time specialty of producing parts being the moving parts of mechanical watches which together form the moving parts of mechanical watches. 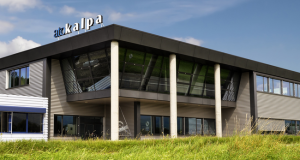 As of 2005, Atokalpa has also made every escapement and regulation part of the watches. All together some 20 parts forming the escape wheel, pallet, roller, balance and balance spring. Producing those parts requires being a perfect master of a complicated and precise production process: cutting, turning, slotting, rolling, surface and heat treatment, assembling as well as drawing and laminating the balance spring. 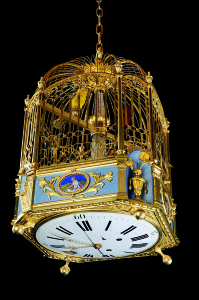 Based in Moutier Elwin has been part of the watchmaking hub of the Sandoz Family Foundation as of January 2001. It was established by the third generation of a group of industrialists who, since 1912, have been specialised in turning bars for the watch industry and particularly in making balance bars. Elwin is also known for its numerically controlled bar turning machines and the development of accessory software. Elwin has even developed a new and revolutionary bar turning machine especially designed for the watch industry, with accompanying requirements for microscopic precision. 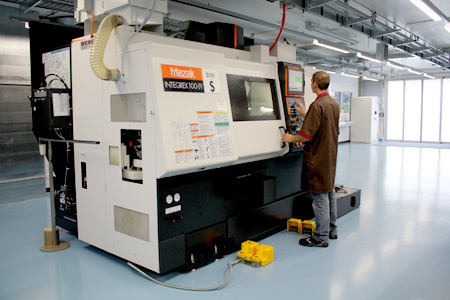 Humard SA in Delemont, specialised in this type of machines, attends the manufacturing and marketing of this device. 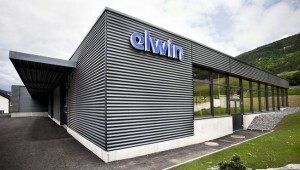 The Elwin production facility has been expanded since. 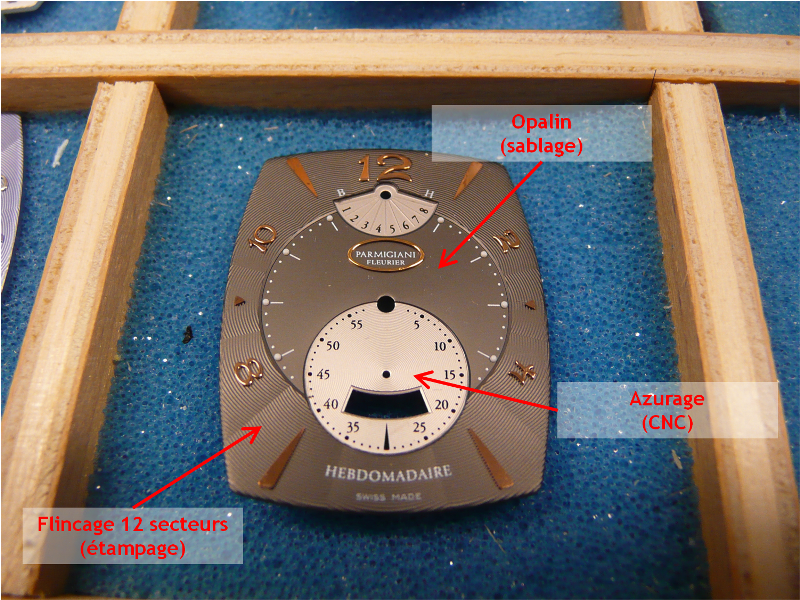 The verticalisation of the watchmaking hub would not be complete without the possibility of making top-quality dials. For this purpose, in December 2004, Quadrance et Habillage was established and incorporated in the industrial structure in order to obtain self-sufficiency in the production process. Other goals were meeting strict quality requirements, improving the balance between supply and demand and increasing the hub’s fundamental creativity. The dials owe their unique appearance to this company. First, at Quadrance, the dial bases are being processed by numerically controlled machines, subsequently guillotinised and plated with lacquer or electroplating. 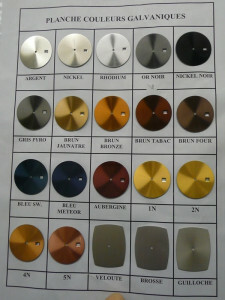 Finally, a dial maker is providing the indicators and attaching the applications. 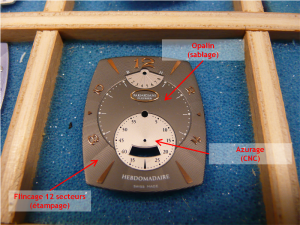 Owing to this production process the dials will always be perfectly sized, for Parmigiani Fleurier itself or a third party. In order to make the watchmaking hub even more complete the Sandoz Family Foundation bought Les Artisans Boitiers SA in May 2000. 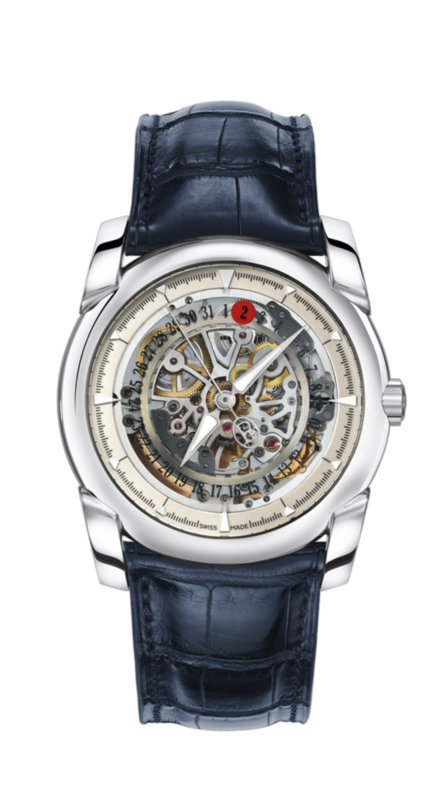 This La Chaux-de-Fonds-based company used to be among the top watch case manufacturers at that time. Apart from its industrial expertise this company provides state-of-the-art technology by using 3D computer programmes (CAD) and CNC-controlled machines. Whether the case is made of precious metals (18-carat gold, 950 platina or 950 palladium) or steel or titanium, Les Artisans Boitiers SA have the possibilities of equipping the cases with any form of complexity, because they are able to make each part themselves. It will take the goldsmith several weeks to equip a model with various complications with a case, like the Parmigiani Fleurier Tecnica, and he will have to perform over 50 actions. In conclusion you may say that the way in which the Sandoz Family Foundation has started business with Parmigiani Fleurier is a perfect example of intelligently turning a small potential watch branch into a fabulous watch-manufacturing organisation with a worldwide reputation for excellence. The watchmaking hub of the Sandoz Family Foundation started in 2000 leading to the Manufactures Horlogeres de la Fondation (MHF), combining various forms of expertise. Today, there are 450 experts with 50 professions working within the hub, four factories and an equal amount of regional watchmaker cultures.